Next articleWomen are increasingly resorting to DIY abortions? Don’t worry, GOP politicians have a remedy for that. After expanding to $1.2 billion in loans in the first 85 years in their existence, the North Dakota Public Bank has expanded to $3.5 billion in loans in the last 9 years. This explosion in loans perfectly coincides with the fracking boom in North Dakota. So do North Dakota home prices. Better wait to see how this plays out. Deposits with the North Dakota Public Bank are not guaranteed by the FDIC, they are guaranteed by the State of North Dakota. Also, North Dakota has half the number of people who live in the City of Phoenix. I’d be wary about drawing any wide conclusions about any experiment that they have performed. The Salt River Project, like the Bank of North Dakota, was formed by a group of farmers and has a similar culture and operates very efficiently and effectively when compared to private sector companies like APS. Farming culture, built up over millenia, is brutally competitive where working from dawn till dark is the norm and not a penny is wasted. There is no guarantee or even likelihood that a new public bank would get a transfusion of such a culture. How about we just break up the big banks, and only allow local banking? No crossing state lines, and for for larger states, limit them further. The result would be banks that care about the local economy. 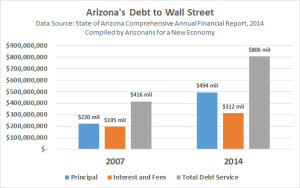 They would make loan decisions on local needs, not ROI for Wall Street. And you’d create a few hundred CEO’s and staff all the way down to tellers, instead of having just 6 major banks and 6 CEOs. More jobs. Still private, but not Too Big To Fail. Still Capitalism, but controlled by local market forces, and so we avoid another 2008. North Dakota is the only state whose economy didn’t crash when Wall Street did in 2008 because their money was invested safely on Main Street and not on Wall Street. The crash was before the fracking boom. Forty percent of the banks worldwide are public banks. There is only one in the US because we allow ourselves to be controlled by Wall Street. Oil production in North Dakota went from 60 million barrels in 2008 to 400 million barrels in 2014. Their Gross Domestic Product went from 32 billion in 2008 to 55 billion in 2014. Oil averaged $90 a barrel in 2014. 340 million times $90 a barrel equals $31 billion. It appears that almost all of the gdp increase was oil. In fact, their underlying economy appears to have shrunk a little. They are going to have one heck of a decompression headache with oil at $36 a barrel. What is going to happen to their bank? What is going to happen to all their depositors who don’t have FDIC? It’s an intriguing idea, lets see if it can withstand this stress test. 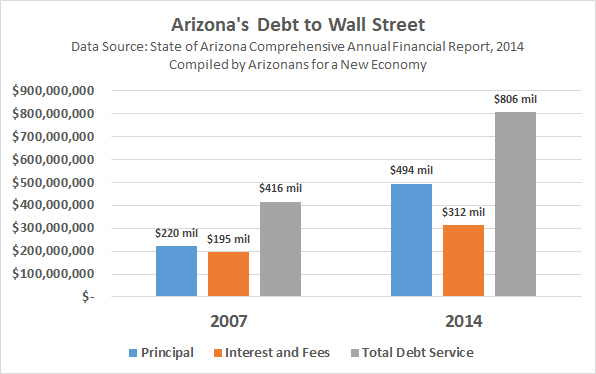 Arizona is paying $312 million per year in interest on its debt. Multiply that by 49 states (since North Dakota is the only state smart enough to have a public bank), and you will realize that $650,000 is a tip in comparison. Pam, it appears you missed the point of captain arizona’s comment. My point is that $650,000 is chump change to these people. Yeah, I got that from the original comment. But it still appears you didn’t get captain arizona’s point. if we say no how will wall street be able to fund mrs. clinton’s campaign? Where will goldman saachs get the $650,000 to give hillary for her speaking fees? Any candidate who needs contributions would have to come to us, not Wall Street. Any time Wall Street’s influence is diminished we win. But even better would be to get id of Citizen’s United by a constitutional amendment voted in by initiative and referendum by the people in those states with citizen’s initiatives, and legislatures in states without. On the other hand a quicker route is to elect Either Bernie or Hillary and get a new Supreme Court justice who feels that Citizen’s United was wrongly decided. Yes – getting rid of Citizens United and gerrymandering and changing laws to guarantee universal automatic voter registration would dramatically change the political influence structure.